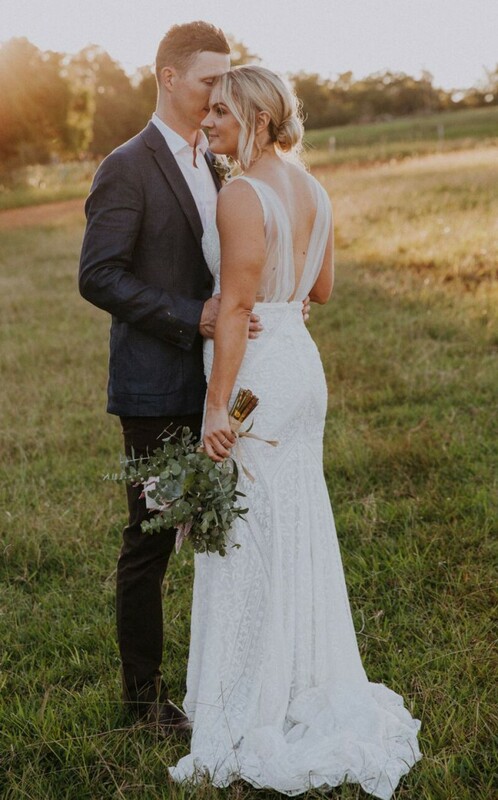 Rue De Seine ‘Tulum’ gown purchased from Sphere Collective on the Sunshine Coast. Worn April 2019 and dry-cleaned. Arm bands never work, and only slight alterations including hem trim to my height of 168cm with 9cm heels. This dress is very flattering and was so comfortable all day and night. Tulum has a classic shape with bohemian charm and signature Rue flair. With an embroidered full silk skirt, Tulum is well balanced with a fitted bodice. Illusion tulle cut outs and armband additions are used to maintain a youthful and fashion forward aesthetic to this romantic, feminine gown. Hemline taken up to my height and tulle addition to the backless dress to hold up straps. Can send more pictures of the back if interested.